Bell peppers provide more than just color and crunch to dishes. These vibrant vegetables are a source of valuable nutrients, fiber and antioxidants. Available year-round, bell peppers are at their peak in August and September. Bell peppers come in green, as well as ripened versions that turn red, yellow, orange and purplish brown. Including these vegetables in your diet enhances your health. Green bell peppers provide 551 international units, or IU, of vitamin A per 149 g, or approximately 1 cup chopped. Red bell peppers are higher in this vitamin, essential to healthy eyesight, with 4,666 international units -- almost a day's worth, based on a 2,000-calorie diet. A cup of chopped peppers of any color provides more than 100 percent of the daily value of the antioxidant vitamin C, which supports tissue health and immunity. Peppers also provide folate, which supports the functioning of red blood cells and is especially important for pregnant women because it helps prevent certain types of birth defects in unborn children. Folate might also help prevent colorectal cancer, but studies are inconclusive. Bell peppers are also a source of vitamin K, essential to the clotting function of blood. 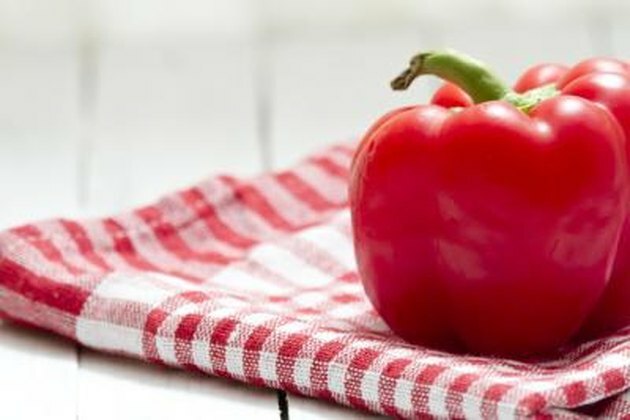 A specific type of antioxidant, known as lycopene, gives red bell peppers their color. It is a carotenoid that helps fight free radicals you acquire from natural exposure to environmental toxins. Lycopene might also help prevent certain types of cancer, especially prostate cancer in men. Yellow and orange peppers are also rich in carotenoids, which might protect your heart from cardiovascular disease. All colors of bell pepper are high sources of potassium. This mineral helps keep your fluids and minerals balanced in your body, enhancing muscle function and regulating blood pressure. One cup of green pepper contains 261 mg of potassium, while red and yellow varieties offer more than 300 mg per cup. Bell peppers provide 3 g of fiber per cup, which can help regulate digestion and cholesterol levels. One cup of chopped pepper contains between 30 and 40 calories. Peppers offer a sweet flavor and satisfying crunch, which makes them a good substitute for high-calorie chips in dips such as hummus or salsa. Sauteed peppers make a healthy accompaniment to chicken fajitas and steak. Add peppers to salads or casseroles to boost serving sizes without adding notable calories.